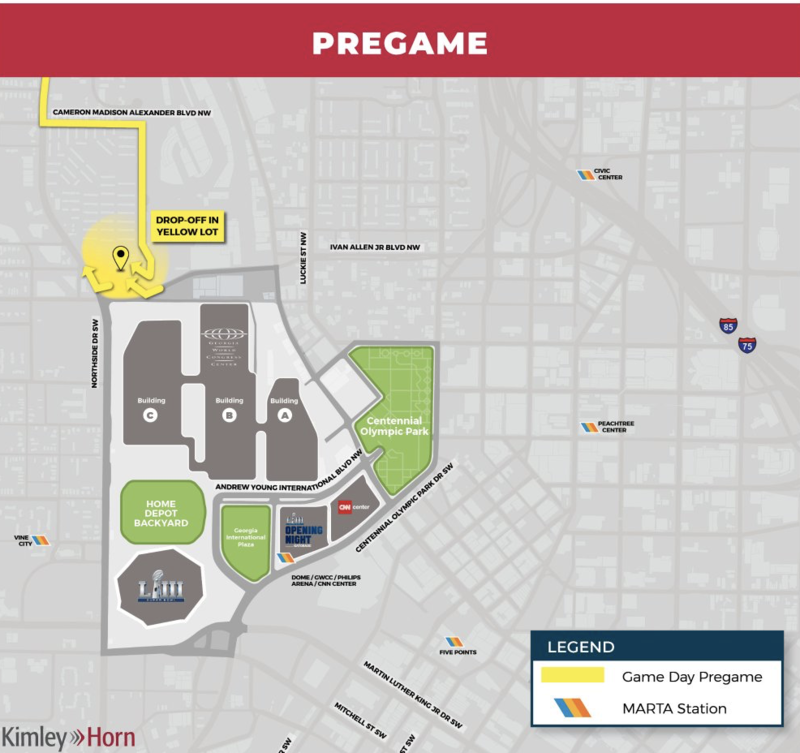 Pregame: Uber/Lyft dropoffs are in the YELLOW lot, north of the stadium at 434-450 Gray St NW, Atlanta, GA 30314. View Google Map. Football fans all over the country are restlessly prepping of the upcoming Super Bowl LIII this Sunday. With ticket prices for the game reaching $2,487.50 and bundles for hotels at $5,645.00, the trip to Atlanta's state-of-the-art Mercedes-Benz Stadium will be having thousands of fans reaching deep into their wallets to enjoy America's favorite pastime. For many fans, the stress of these prices plus the anxious hope of your team playing can put a damper to a great weekend, but one aspect of your Super Bowl weekend doesn't have to be as worrisome or expensive; traveling. Ride-hailing platforms such as Uber and Lyft have long been marketing the Super Bowls, and this year they both have provided riders with tons of opportunities to save on their trip. The two apps can help you avoid expensive rentals, parking, and save you big, both in time and money. 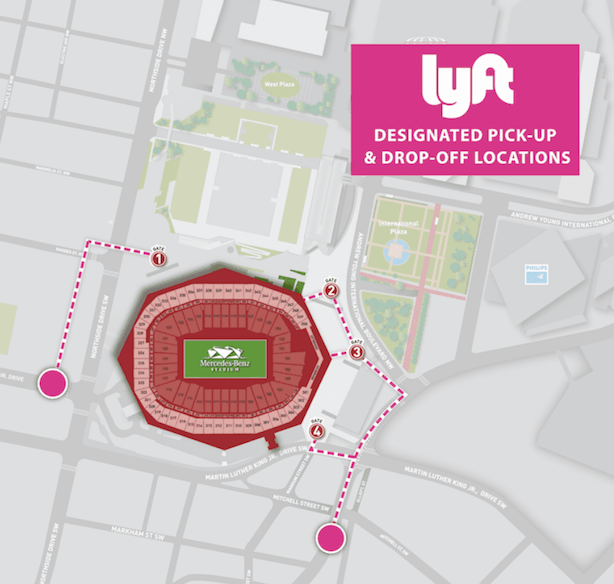 The Uber and Lyft dropoff and pickup points at the Mercedes-Benz Stadium. 1. For visitors in Atlanta, avoid the expensive rental cars at the airport and save by using a ride-sharing service. Airports are notorious for the "convenient" car rentals and taxi services offered directly within the terminal and their inconvenient pricing. A rental car in Atlanta can cost upwards to over $100 over the Super Bowl weekend. Luckily, Uber can help you save on your trip to your hotel. Atlanta's closest airport to the game, the Hartsfield–Jackson Atlanta International Airport, is a convenient short car ride away from Mercedes-Benz Stadium. Using Up Hail, we can get a good estimate of how much a ride from the Hartsfield–Jackson Atlanta International Airport to one of the sponsored hotels for the game would be. We can also view the available service options such as SUVs, or shared options (ie. Lyft Line), with the starting at rates and cost per mile and minute. To the Staybridge Suites in Midtown Atlanta, the trip will only cost you roughly less than $40 when taking into consideration surge pricing. To The Whitley, prices are slightly higher at around $45-$50. *These prices are merely estimates but provide a range of possible and predictable prices. Up Hail allows you to gauge the price of an Uber, Lyft, and many other ride-share services by estimating the traffic and surge price. Last Super Bowl, the surge price went as high as 3.9x regular prices in Minneapolis. Many riders can feel sideswiped when their trip in an Uber cost much more than expected due to surge prices, so Up Hail's service can save you the shock of Uber's pricing and (most importantly) money. With a capacity of over 70,000 people, the Mercedes-Benz Stadium is going to be filled as well as its parking lot. Parking permit prices for the stadium also rank up to $114 with an average price at about $46.20. If the stress of buying a $114 permit ahead of time isn't too much of a worry, the traffic in Atlanta this Sunday is expected to be so congested that Atlanta's Deputy Chief, Scott Kreher, has urged attendees to avoid driving and use ride-share, the metro, or even walking. Uber can help you save the time, hassle, and money of driving directly to the stadium. A 20 minute trip from The Whitely to the Mercedes-Benz Stadium can cost around $13-$40 depending on the surge price. The 14-minute ride from the Staybridge Suites can cost you about $12-$38. Uber's main competitor, Lyft, also is offering riders many cheap deals on transportation this weekend. When compared to Uber using Up Hail, Lyft is almost always cheaper. A trip from the Hartsfield–Jackson Atlanta International Airport to the Staybridge Suites and The Whitey can cost from $12-$38 and $19-$48 respectively. A Lyft ride from the Staybridge Suites to the stadium can cost from $9-$26 and from the Whitley, you can expect to pay about $10-$30. Lyft also beats out Uber with conveniently designated drop off points at the stadium. 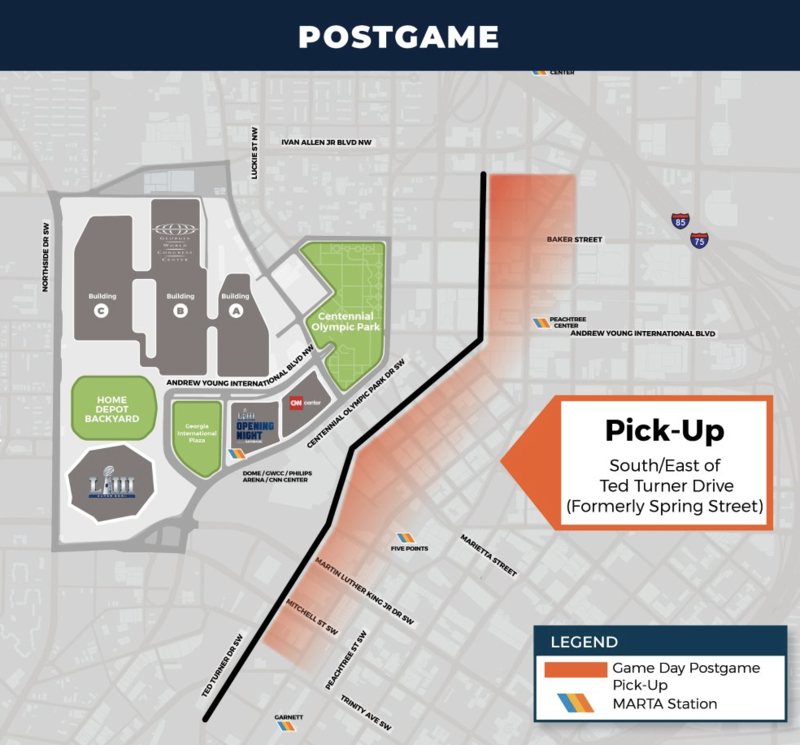 Each drop off point is within walking distance to the game, allowing passengers to avoid the traffic right at the stadium. The Mercedes-Benz Stadium lists each of the drop off points on their website and allows for greater ease on game day. Atlanta's local metro system, Metropolitan Atlanta Rapid Transit Authority or MARTA, runs on four lines that cover almost 50 miles of the city. With free parking (on a first-come-first-served basis) and convenient one day passes priced at $9.00, using MARTA is a quick way to navigate your way to the Mercedes-Benz Stadium. Lyft is making using MARTA even better with the offer of 50% off using the code SUPERMARTA to save up to $10 on 10 rides all this week. This code doesn't cover Lyft trips to and from Atlanta's Hartsfield-Jackson International Airport. Uber can also help get you to the game with 50% discount on a ride from MARTA stations using the code MARTA4GAME. For two hours before and after the games, passengers can save money in either an uberX or uberPOOL to one of the stations. Although the Mercedes-Benz Stadium boasts an impressively cheap menu of $2 hot dogs and refillable sodas, a stadium full of 70,000 excited sports fans is bound to create long lines for these deals. You can enjoy your own food of choice from Atlanta's diverse restaurants in a quick and easy way though Uber Eats. The food delivery service will be offering a promo code on February 2nd through the 5th that saves you from paying the delivery fee. With the expected higher than average surge prices, free delivery can save you extra cash on your order of wings and other sport-watching favorites. 6. Even if you lose, you can still win! Regardless of which team takes home the coveted Vince Lombardi Trophy this year, both Patriots and Rams fans in Boston and Los Angeles can score their own touchdown after the game. The Unhappy Hour grants the Uber Rewards members in the losing city a free ride after the game. The promo is valid for UberX, UberXL, UberPOOL, Express Pool and WAV trips in either Boston or LA up to one hour after the game. The only way to take advantage of this winning opportunity is to become a Uber Rewards member, which can also help you save and make money other days with the various benefits Uber offers like $5 for every 500 Uber Points. Bonus Tip: For football fans who stayed at home to watch the big game, you can still save big this year. Every major city offers up tons of restaurants, bars, and even music events to celebrate the big game. Whether you're in Washington DC, New York City, Chicago, Miami, or cheering on from the two major cities this year, Los Angeles and Boston, you can still enjoy the game right in your home city. Uber and Lyft offers still can help you save on the ride home, and through the Up Hail app you can see various promo codes, limited time offers, and coupons that can help you get home safely and for an affordable price, such as Up Hail's own Lyft promo coupon code UPHAILDOTCOM for up to $50 in free rides!